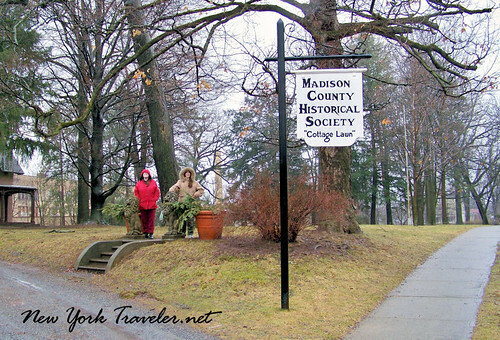 Almost two weeks ago, on a soggy, dreary day, the girls and I took a drive out to Oneida, NY, to see the Madison County Historical Society home. 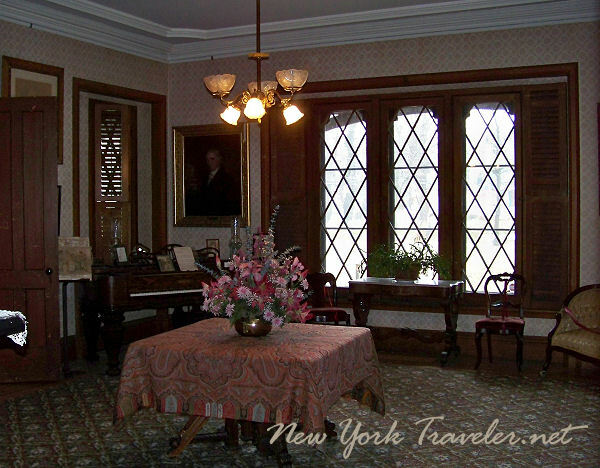 It was once the gracious home of the Higinbotham family of Oneida. 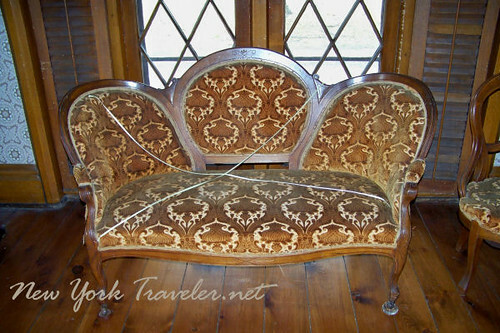 The home was built in 1849, and remained in the family up until 1930s, when one of the daughters donated it to the Madison County Historical Society. So the house remains in near-pristine condition, with some of the original family heirlooms on display. I love houses like these: it’s like walking back in time, and you can really get an idea of how life was like 150 years ago in America! 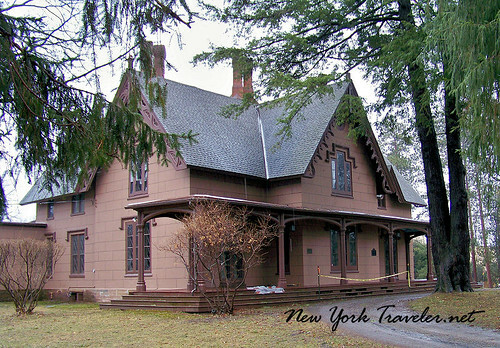 The home was named “Cottage Lawn” by the mistress of the house, Eliza Randall Higinbotham, after the writings of A.J. Downings. The house is lovely. On first glance, it appears to be Gothic Revival, due to its pointed windows and doors and steeply-pitched roof. Architect Alexander Jackson Davis called it “English cottage style.” And it does have a lovely, cozy cottage feel to it. 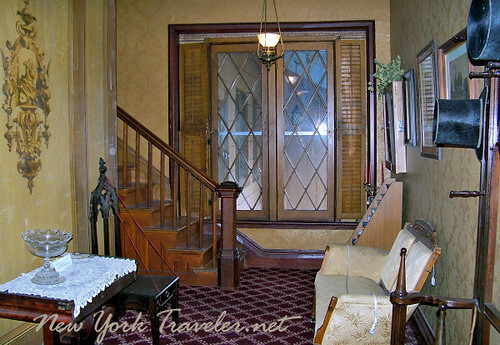 We’ve been to a lot of historic homes, and none were as “homey” and warm as this one. We could envision young children playing games in the parlor, with the smell of fresh bread and coffee coming from the kitchen. The Higinbotham family were a family of philanthropists and socialites. They were close companions of Gerrit Smith, that famous New York abolitionist with his fascinating history (I wrote about him, here and here). His benevolent presence is felt throughout the house, as there are numerous portraits of him and his wife that hang in the rooms. 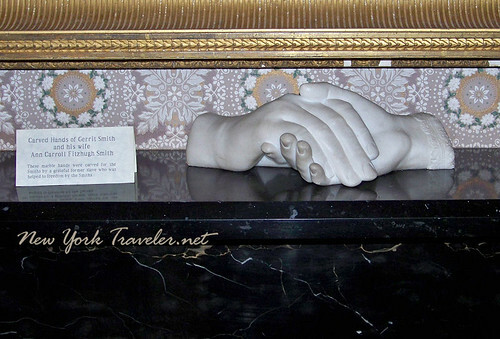 And there is a unique sculpture of two intertwining hands, that of Smith and his wife. It was sculpted by a freed and grateful slave (Smith ran the Underground Railroad here in New York State). This sculpture was originally at the Smith’s home in Smithfield (we visited the site here). But the Smith home suffered a fire that destroyed the home– yet, this sculpture was saved. 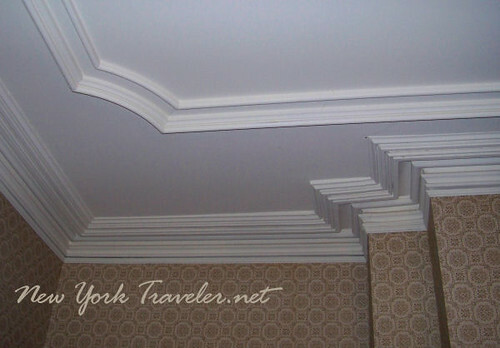 It sits on a marble fireplace mantel in the South Parlor of Cottage Lawn. Oddly enough, Smith’s wife, Ann Carroll Fitzhugh Smith, was a relation to George Fitzhugh, a Virginian who wrote extensively in defense of slavery. Fitzhugh and Smith, friends and relatives, wrote frequently to each other about the slavery issue, among other things. But it is notable to mention that these two men from opposite spectrums of the slavery issue could even maintain a friendship, when the Civil War was a mere breath away. Well, I’m getting ahead of myself here. But this area is so stock-full of history it is overwhelming at times! 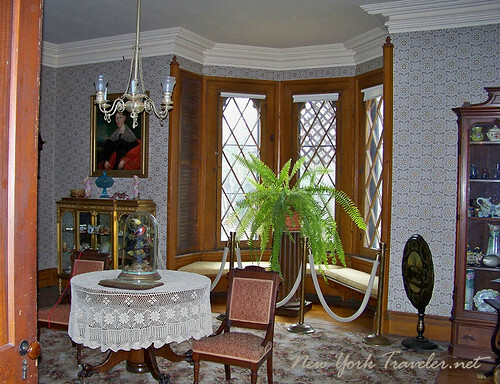 The South Parlor– the main formal room– is lovely. Notice that the shutters are on the interior of the home. 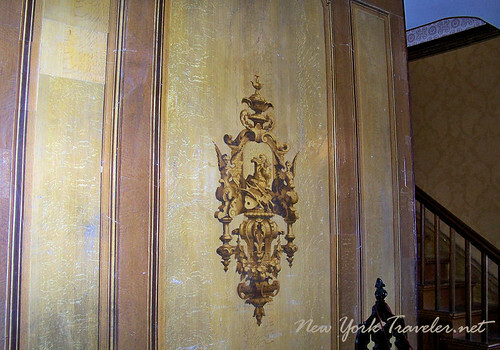 This is the only section with the original wallpaper from the 1849 installation. 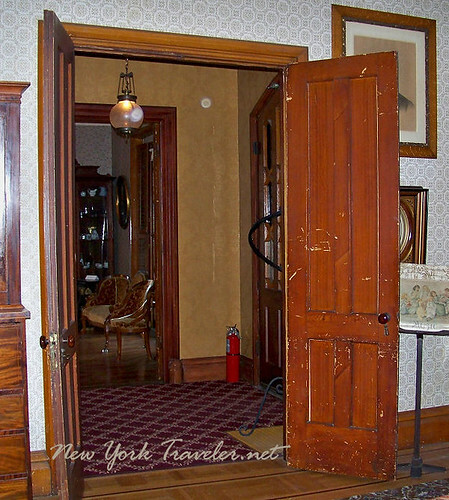 I love the doors– double doors. One of the daughters of the family, Julia, was an invalid in a wheelchair. She was an acoomplished musician, and some of her music has been published. The Historical Society breaks out the Chickering Piano every Christmas, and Julia’s music is played for the festivities. This is the Music Room, and the piano is behind the center table. 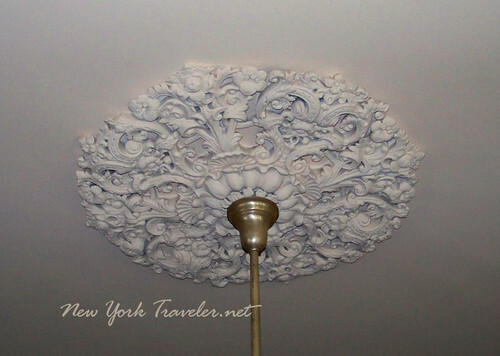 The home is filled with all sorts of little quirky curiosities, things that I love! 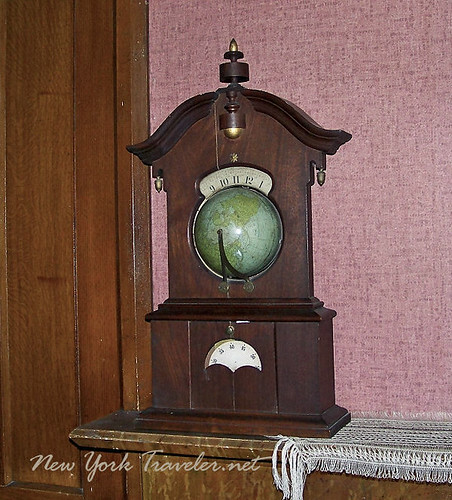 This is an old Timby Solar Time Globe clock, dating from 1863. Only 600 were produced. The top dial shows the hours, the bottom dial shows minutes. And the globe spins once every 24 hours! I love it! Here’s another lovely rococo-looking clock, probably made in Germany. 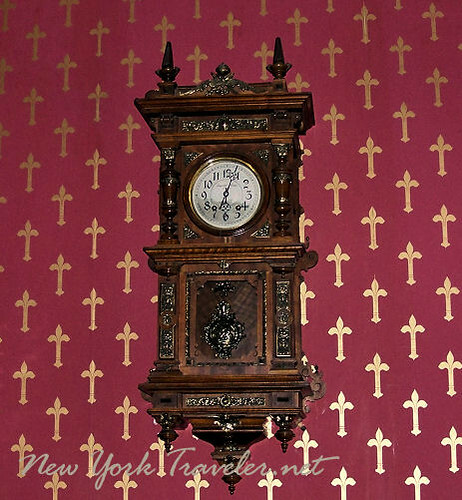 I am a great admirer of old clocks. 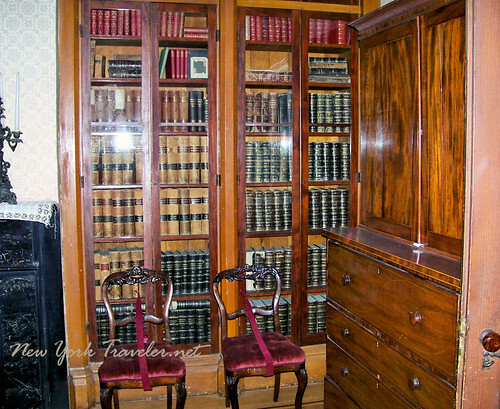 The books resting in the bookcases looked scrumptious! I love old books. There is so much more to write about, seeing this lovely home. I will have loads more photos and information, and some fascinating trivia, too– so be sure to check in again for the next post. I would like to thank Carolyn, our tour guide at Cottage Lawn, who was delightful to talk with. It is so wonderful to chat with a person who has such a burning passion for history, too! And she very graciously gave me a copy of her tour guide manual, to aid me in my posts here at this blog. Plus, she happened to mention that she knows a McCumber from Kirkville, NY– where my ancestors come from! I’ll have to look more into that. Thank you, Carolyn! That is a beautiful home. It’s seems to have been kept very well. One to add to my cross country trip list for sure! wow, that is a really beautiful places. Madison County has been very supportive of the North Country Trail! yes, i believe in you, by looking back of old houses that has been preserved for centuries reflects our past and history of the peoples who lived in the area. Awesome pictures! Just beautiful scenery. Thanks for stopping by! Thanks for your comments! The home has been kept up very well. It’s very cozy. There are a few offices for the Historical Society here– I would love to work in an office like they have here! that home is very beautiful on the outside… i lived in oneida (madison county) my whole 20 years of living and i have yet to go into that amazing house. everytime i walk by that place i feel comfort because on the outside it’s just honestly hard to explain. you have to go and see it yourself. Thanks for your lovely walk down memory lane of Oneida and Hamilton. My great grandfather, Wm. H. Baker, bought either a house or lot in Oneida about 1864 on Main Street (that’s my stumbling block presently); I spent my summers in Oneida in that house playing with my cousin. How do I find the answer to my question? Thanks for your good efforts. Joan Baker Bakeman. Hi Joan, thank you for your comment. You may want to contact the local historian or public records worker (or county clerk) in the village. They may be better able to direct you to Census records, perhaps. I wish you well!